All of London is all abuzz about this month’s royal wedding. After all, a British Prince has never married an American before—at least not without having to give up his title. The day Prince Henry Charles Albert David of Wales marries American actress and tireless charitable advocate, Rachel Meghan Markle, the happy couple are expected to draw a crowd of 350,000 in England alone. 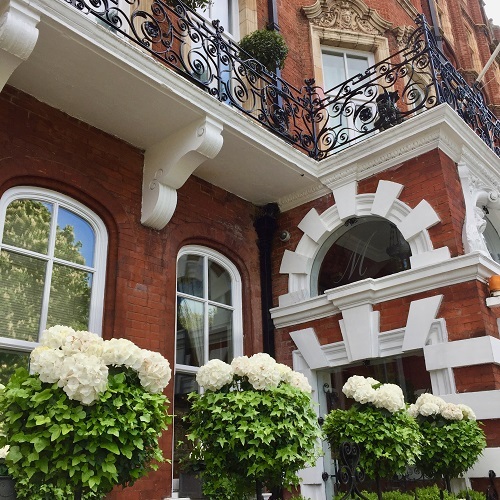 But nowhere is the event being celebrated quite as it is right across the street from Kensington Palace where the royal couple will live. 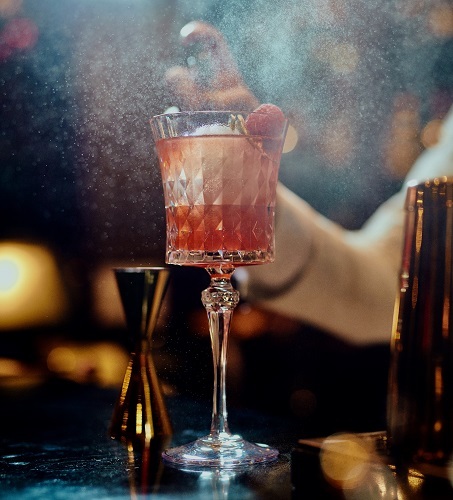 At Stables Bar in the five-star Milestone Hotel, bartender extraordinaire Angelo Lo Greco has created the Dutchess Hourglass, a cocktail that salutes not just to the future Duke and Dutchess of Sussex, as the couple will be known, but the whole British royal family. Mr. Lo Greco is truly an alchemist. A native of Agrigento, Sicily, the 29-year-old has been bartending for eleven years. “My mother said “Why do you want to become a teacher, when you can become a bartender?” he jokes. But it was a bartender in Agrigento whose acrobatics with glasses and cocktail shakers inspired Angelo. Signora Lo Greco must be proud of his many contests and awards won during his seven years in Rome, prior to coming to London four years ago. Working in a tiny bar space, Lo Greco and his crack team of bartenders Laura, Giacomo and Wadie, create completely unique flavors with concoctions like cloves and coffee beans to infuse the Campari used to make the Dutchess Hourglass. For this drink, the bartender trades on the preferences of Queen Elizabeth II, grandmother of the groom, who has a fondness for Campari and gin. 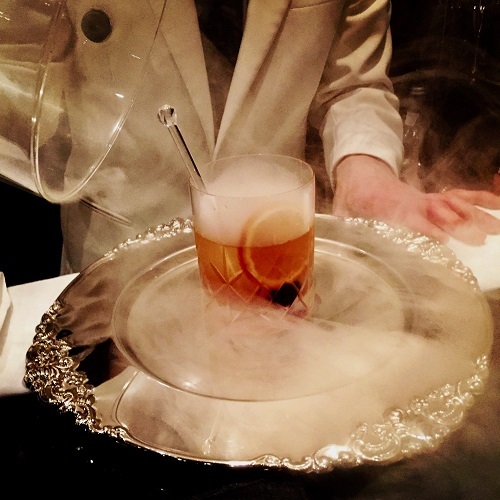 For both the Dutchess Hourglass and the hotel’s specialty, the decidedly different Milestone Old Fashioned, the centerpiece is a single ice cube made using a copper device which, through kinetic energy, takes a square block of ice and transforms it into a perfect round globe in about two minutes. The Dutchess Hourglass is theater as the elixir slowly cuts through the ice, providing the drinker with a visual delight as the bottom of the glass slowly fills with pink liquid. The bar’s signature Milestone Old Fashioned is anything but old fashioned. It’s as modern as the couple themselves. Lo Greco and team first turn the Seville orange peels from the hotel’s morning orange juice into a golden syrup made with caster sugar and fifteen to twenty peels which becomes Oleo Sacchrum. How’s that for sustainability! Even the traditional Angustura bitters are replaced here. Milestone bitters are created by infusing rum with botanicals like grapefruit skin, cloves, nutmeg, and peppermint tea. The liquors used to make the drink are aged in one-liter oak casks for six months. There’s a Bourbon Scotch blend and, surprise, both rum and tequila. While the drinker chooses the liquor, the perfectly round ice cube is branded with the hotel’s signature “M” for Milestone. Two teaspoons of Oleo Sacchrum, five drops of Milestone bitters, and finally, the patron’s choice of liquor are added to the glass. The drink is topped with an exquisite dried orange slice and a Maraschino cherry. But it doesn’t stop there. There’s more theater as the glass is placed under a glass dome and a hoookah is attached to the dome. Fueled with a double apple flavor, the smoke adds the final flavor note. Whether you choose the Dutchess Hourglass or the signature Milestone Old Fashioned, each provides a superb way to raise a glass to a fairy tale love story that’s bound to have a very happy ending. Cin cin, Angelo, Laura, Giacomo and Wadie. Sounds like a rift on a Negroni. This kind of creativity is fun. Would so love to visit and have a go at one of these. Huh, all of a sudden I’m heading to my private bar and pulling the Campari, Martin Miller Gin, Cocchi Vermouth; peel an orange and drop a Luxardo cherry! Now I just need a cigar and a large ship to go with it! !